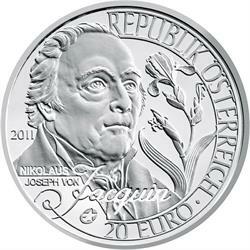 Home > history > explorers > 2011 Austria €20 Silver Proof "Nicholas Jacquin"
Issued on February 23, this release celebrates the life of explorer and Imperial Botanist, Nicholas von Jacquin. The coin is part of the eurostar series, which includes 8 countries that are issuing coins this year as part of the pan-European program celebrating European explorers. Nicholas von Jacquin was a true European. Born in Leiden, Holland, in 1727, he moved to Vienna, where he was commissioned by the Emperor Franz (husband of Maria Theresa) to lead a natural science expedition into the Caribbean. Between 1754 and 1759 he visited many Caribbean islands like St. Vincent, Grenada, Aruba, St. Kitts, Haiti, Jamaica and Cuba, as well as exploring the coastal regions of Venezuela and Columbia. He sent back seven collections of plants, animal and artifacts to Vienna. Jacquin is regarded as the initiator of the Austrian expeditions of exploration. 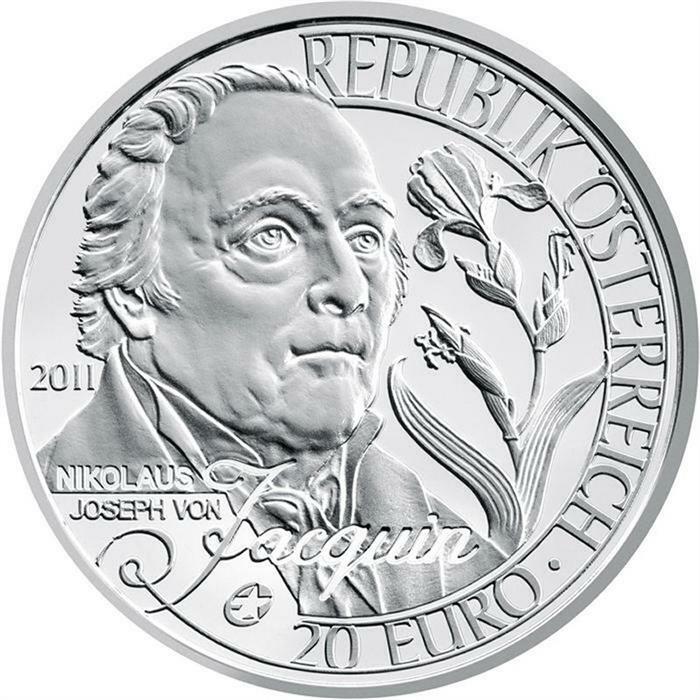 The obverse shows Jacquin’s portrait together with “Iris Variegata”, one of his many discoveries. The reverse depicts him at work in the Caribbean cataloging his botanical discoveries. Each coin comes in an attractive box with a numbered certificate of authenticity.